Official photo of OECS leaders and the new Hon. Prime Minister of Barbados Mia Mottley. The Sixty-Fifth Meeting of the OECS Authority was held at the Harbor Club, Saint Lucia, during the period June 18-19 2018, under the Chairmanship of Dr. the Hon. Ralph Gonsalves, Prime Minister of Saint Vincent and the Grenadines. The Meeting was preceded by an Opening Ceremony where remarks were made by the outgoing Chairman of the Authority, Prime Minister of Saint Lucia Hon. Allen Chastanet; the Director General of the OECS Commission, Dr. Didacus Jules; Prime Minister of Saint Vincent and the Grenadines and incoming Chairman of the Authority, Dr. the Hon. Ralph Gonsalves; and specially invited guest of the Authority, Prime Minister of Barbados, Hon. Mia Mottley. The Ceremony was chaired by the Commissioner of Saint Lucia to the OECS H.E. Ambassador Elma Gene Isaac. His Excellency Alfred Marie-Jeanne, President of the Territorial Authority of Martinique. Ambassador Elma Gene Isaac, Commissioner to the OECS for Saint Lucia. Ambassador Lionel Sydney Osborne, Commissioner to the OECS for Saint Kitts and Nevis. Ms. Murielle Lesales, Commissioner to the OECS for Martinique. The OECS Member States of Anguilla and the British Virgin Islands were not represented. Dignitaries in attendance included the Governor General of Saint Lucia, Sir Neville Cenac; Former Director General of the OECS, Sir Vaughn Lewis; Ministers of the Cabinet of the Government of Saint Lucia; Leader of the Saint Lucia Parliamentary Opposition, Hon. Philip J. Pierre; and members of the Diplomatic Corps. 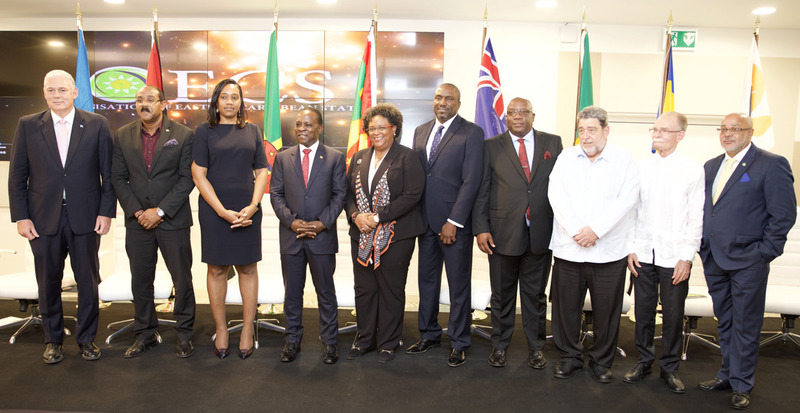 OECS Heads of Government welcomed the esteemed presence of the Prime Minister of Barbados, Honourable Mia Mottley to the 65th OECS Authority Meeting and engaged the newest leader in the region in comprehensive discussions on the further advancement of regional integration and deepened cooperation. The Meeting addressed the ease of travel for OECS nationals through Barbados and considered a number of practical suggestions in this regard. The Authority continued discussions on the consolidation and strengthening of diplomatic missions overseas and welcomed the commitment from the Government of Antigua and Barbuda to subscribe to the joint representation in Brussels. The Meeting also discussed the appointment of an Ambassador to Brussels and received an update on the re-establishment of a joint diplomatic Mission in Canada. Heads of Government further discussed strategic representation on the African Continent and endorsed the appointment of a non-resident ambassador for the African Union with a remit to specifically engage countries such as Ethiopia, Nigeria, Egypt, Algeria and South Africa, which represent a broad range of interests on the continent. The Meeting also considered the establishment of a permanent resident mission in the Kingdom of Morocco, given the deepening ties with this northern African nation. The Authority received a report on the CaribSky initiative, which seeks to coordinate the routes of three regional airlines; the Leeward Islands Air Transport (LIAT), the Windward Islands Airways International (WinAir) and Air Antilles. The Meeting conveyed its support for the project and the need to streamline the air transport system to improve the service for all travellers within the region. An important conclusion of the Caucus with the Prime Minister of Barbados was the convening of a meeting of Heads to which other countries in the region would be invited to discuss what would be required in a new shareholder agreement to place the LIAT airline on a more sustainable footing. Heads also received an update on the Eastern Caribbean Civil Aviation Authority (ECCAA) and considered areas of improvement ahead of the scheduled 2019 audit by the International Civil Aviation Authority. The Authority considered the situation in Venezuela and noted with concern the effects of that situation on the security of the region. The Authority also viewed with alarm the damage that was being caused to the economies of Member States as a result of the sanctions imposed on Venezuela. The Meeting reiterated its call for dialogue among the parties in Venezuela with a view to resolution of the situation in the country. Heads of Government noted with understanding the difficult situation in Saint Martin following the devastation suffered during the 2017 hurricane season, which naturally slowed the accession process, and agreed to grant observer status to the island nation until such a time as it deems itself ready to assume Associate Membership. The Authority also received an update on the status of negotiations with Guadeloupe, which are progressing steadily. The Authority together with the Prime Minister of Barbados endorsed the initiative by young Saint Lucian entrepreneur and OECS 30 Under 30 Winner, Johanan Dujon, to find a solution to the Sargassum problem and develop a potential industry in the region. The Meeting commended the young businessman and called on other young persons to rise to the challenges being faced in the region, encouraging civil society and the private sector to join with government in the support of such uplifting initiatives. Heads of Government received a presentation on the Caribbean Climate Smart Accelerator, a coalition of Governments and major private sector actors that seeks to address and fast-track mechanisms to build and strengthen the resilience of Small Island states in the Caribbean, and especially the OECS. The Meeting explored specific priorities of the OECS including some of the Mission Critical Issues of the Barbados Government which could be supported through the Caribbean Climate Smart Accelerator. The Authority witnessed the signing of the Terms Of Reference governing the establishment of an OECS Audit Committee. Incoming Chairman, Prime Minister of Saint Vincent and the Grenadines Honourable Ralph Gonsalves, inked the document that will serve as an important pillar in the organisational apparatus of the OECS and fulfill a requirement for many development partners to gain funding. Heads of Government reviewed and approved the 2017-2018 Annual Work Plan and Budget as presented by the Commission. The Meeting further adopted a practical proposal to settle financial obligations of Member States to the Commission reiterating the importance of these contributions to the effective functioning of the Organisation. The Authority also received reports from the Council of Ministers on matters of Agriculture, Education, Health, Foreign Affairs and the Environment. The next Authority Meeting will be held over the period October 25 – 26, 2018 in Saint Vincent and the Grenadines. All Heads expressed their deep appreciation of the hospitality extended by the Government and people of Saint Lucia and looked forward to the speedy implementation of decisions made at the meeting.